Our dry cleaning service offers professional cleaning by DLI trained employees, including technical spotting to remove stains, pressing on the latest equipment, and repairing minor tears. Our laundry service includes shirts, jeans, and khaki pants that may include different levels of starch all depending on the customer’s request. We have three different levels of starch to meet the needs of our customers. Just tell the customer service employee who takes in your clothes if you want none, light, medium, or heavy starch. We also have the ability to box shirts if wanted. Wet cleaning of blouses and slacks is also available. We accept most leathers and furs. The garments are sent to a leather and fur cleaning company in Kansas City, Missouri for processing. The company is well known in our area and has consistently done an excellent job with the garments we have put in their care. We have an experienced seamstress located at our South Monroe store. If you need to try on a garment for alterations, we have a changing room that you can use to try on your garment for measurement. For wedding gowns, we offer pressing, cleaning, and heirlooming/preserving depending on the customer’s needs. Cleaning and heirlooming/preserving include a thorough spot treatment, cleaning and pressing by our trained professionals. We offer a drapery cleaning service that includes cleaning and pressing and is available for both pleated and flat drapery panels. Tablecloths, napkins, bedspreads, comforters, and blankets are items that we can clean for customers. Both of our locations provide a covered drive-thru-service for your convenience. You never have to get out of your car; instead, our customer service employees come to your car to get your clothes or to bring your clothes back to you, along with addressing any special needs or requests you may have. Customers will especially appreciate this service on rainy days or with a car full of children. Our delivery routes run on Mondays and Wednesdays each week. Our delivery driver comes to your home or business, picks up your garments, and leaves any completed orders that we may have for you. 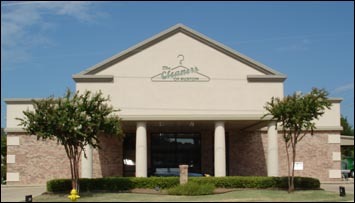 We provide a Cleaners of Ruston express bag that is labeled with your name in order to make leaving your garments for us to pick up even easier on you. There a many of other types of special services that we provide, including cleaning of banners or flags, Church Choir Robes, as well as other various items. Just ask any of our customer service employees about anything you need cleaned or any special other needs, and we will let you know if it is possible.